The From the Heart Fund has created the Community Partnership for Student Well-being. Through this initiative, we seek to develop a behavioral health system of care that will support and enhance students’ behavioral health so as to substantially reduce risk for violence in schools. Tier 1 – All children grades 1 through 12 receive Tier 1 interventions through universal screening for behavioral health problems and classroom-based teacher interventions. Tier 2 – Based on ongoing teacher observations, children identified at highest risk participate in groups conducted by school counselors or other appropriate staff. Tier 3 – Children who are not making adequate progress through Tier 2 interventions undergo targeted assessments and address areas of deficit through school-based counselors and community-based group interventions, parenting education and support, and school-based intensive instruction. 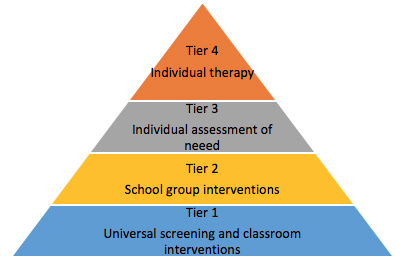 Tier 4 – The children who are not making adequate progress through Tier 3 interventions will be considered for referral to higher levels of treatment within the school or in the community. The Bay City, Palacios, Van Vleck, Tidehaven, and Matagorda Independent School Districts are participating in this campaign. Their teachers and counselors will be trained in recognizing children whose behaviors and mental health have been affected by the trauma of mandatory evacuation and disruption of their lives, and school counselors will be more intensively trained in delivering trauma-informed counseling and support. We also will conduct free family counseling programs for families seeking social/emotional support as they recover from the storm and its effects.